“The natural hotfill line process largely takes out preservatives unlike all our factories in Kenya. 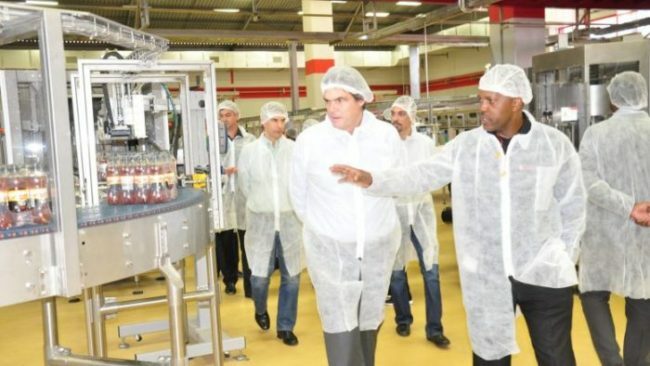 Instead, the product goes into the bottle at very high temperatures,” said Daryl Wilson, the Managing Director, Coca-Cola Beverages Africa (CCBA), Kenya. According to the company, it is the first processing line that will use the hotfill technology in Kenya and the second in East Africa after another one which CCBA owns in Uganda. CCBA operates all three Coca-Cola Bottling plants in Kenya. The others being Almasi Bottlers and the recently acquired Equator Bottlers in Kisumu. Coca-Cola sources fruits from local farmers. For the newest product, mango with bits, the fruit comes from Murang’a. “The Public Procurement and Disposal Act will give close attention to the requirement of the 40 per cent local content policy which Coca-Cola is already exceeding,” said President Uhuru Kenyatta who commissioned the new plant. Duncan Kimani (right), the Manufacturing Director at the CCBA- Nairobi Bottlers Ltd, takes Brian Smith on a tour of the new hot fill line located in Embakasi.